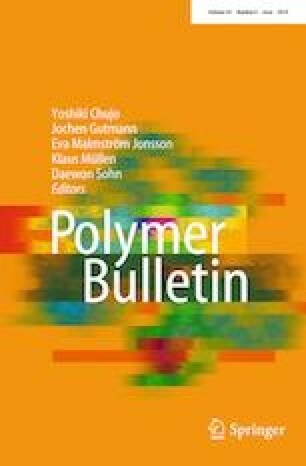 Novel magnetic hydrogels based on acrylamide/2-acrylamido-2-methyl-1-propanesulfonic acid/poly(ethylene glycol) were prepared by free radical solution polymerization using ammonium persulfate/N,N,N′,N′-tetramethylethylenediamine as redox initiating pair in the presence of poly(ethylene glycol) dimethacrylate as a cross-linker. In this study, the water uptake and dye sorption performances of a series of novel magnetic hydrogel sorbents were investigated. For the preparation of magnetic polymeric hydrogels and semi-IPNs, they were loaded with iron (Fe2+, Fe3+) ions. Dynamic swelling tests were applied at 25 °C gravimetrically. According to obtained data, swelling kinetics parameters and diffusion mechanisms were calculated. The magnetic hydrogels synthesized in this study showed high water absorbency. Some water uptake and diffusion parameters were calculated, and they were discussed for the hydrogels prepared under various formulations. Structural characterization of polymers was completed with Fourier transform infrared spectroscopy analysis. Scanning electron microscopy images were taken for the determination of surface porosity of hydrogels and semi-IPNs. For adsorption studies, Janus Green B was chosen as model molecule. It was determined that semi-IPNs and hydrogels adsorbed Janus Green B from aqueous solutions at high levels. Consequently, the hydrogels developed in this study could serve for potential applications in wastewater treatment for water and dye uptake. The work was supported by Aydın Adnan Menderes University Research Fund, under project number FEF 12033.